Welcome to our blog series on how to apply the principles of positive youth development: curiosity, sociability, resilience, self-awareness, integrity, resourcefulness, creativity, and empathy. 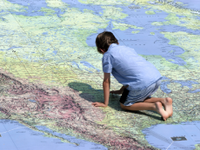 The world has changed dramatically since the early 1900s when Montessori made her mark in education. Yet the same goal remains: scaffolding children toward self-sufficiency. How does this occur today, particularly when test results often seem more important than the development of a child ready to tackle career-life challenges? In a nutshell, it happens when we understand how children and teens successfully mature to adulthood and how we impact their growth in key developmental areas. Based on decades of research in child and adolescent development, neuroscience, education, and psychology, we know that relationships with teachers, parents, and other supportive adults determine how school-age children acquire their personal guidance systems, full of interconnected abilities and pathways to success. When we envision those abilities as an internal compass, it's easy to see how education and development go hand in hand -- how children navigate successfully through school and life. 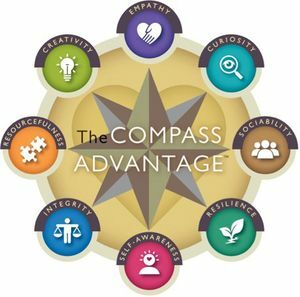 I created The Compass Advantage™ model as a visual, research-based, engaging way for families, schools, and communities to apply the principles of positive youth development. A framework for understanding why kids need these interconnected abilities and how they're nurtured in different contexts, it's also a call to act on behalf of children who deserve to live full, meaningful lives beyond external measures of success. Curiosity is the ability to seek and acquire new knowledge, skills, and ways of understanding the world. It is at the heart of what motivates kids to learn and what keeps them learning throughout their lives. Curiosity facilitates engagement, critical thinking, and reasoning. We nurture children's curiosity and other life-long learning skills when we encourage them to identify and seek answers to questions that pique their interests. When we help them recognize failure as an opportunity for exploration, we encourage experimentation and discovery. We help them understand the tenets of engaged learning when we recognize the different ways they explore -- touching, tasting, climbing, smelling, etc. -- and praise them for their perseverance in finding answers. When we show them how parts connect and influence the whole of society, they discover that curiosity improves relationships, fuels innovation, and drives social change. Sociability is the joyful, cooperative ability to engage with others. It derives from a collection of social-emotional skills that help children understand and express feelings and behaviors in ways that facilitate positive relationships, including active listening, self-regulation, and effective communication. We impact children's sociability when we help them understand that the words they choose make a difference to the relationships they create. When we teach them that every social interaction is tied to an emotional reaction, we help them avoid impulsive behavior and think through difficult situations before acting. We also build their capacity for collaborative teamwork. Self-awareness is the ability to examine and understand who we are relative to the world around us. It's developed through skills like self-reflection, meaning making, and honing core values and beliefs. It's situated at "true south" on the compass to symbolize that introspection is about looking into ourselves. Self-awareness impacts children's capacity to see themselves as uniquely different from other people. We stimulate students' self-awareness when we engage them in reflective conversations about values, beliefs, attitudes, and moral dilemmas. By encouraging them to understand and attend to their intellectual, emotional, social, and physical selves, we let them know that we value their full human potential. Integrity is the ability to act consistently with the values, beliefs, and principles that we claim to hold. It's about courage, honesty, and respect in one’s daily interactions -- and doing the right thing even when no one is watching. We shape children's integrity by treating them with respect and dignity, and listening to their feelings and concerns without judgment. When we praise students for demonstrating their values, beliefs, and principles through actions, we remind them of their value as ethical human beings, beyond a grade or test score. Resourcefulness is the ability to find and use available resources to achieve goals, problem solve, and shape the future. It draws on skills like planning, goal setting, strategic thinking, and organizing. We encourage students to be resourceful when we set high expectations and support them to accomplish their goals. When we teach them to be strategic thinkers and adaptable problem solvers, they learn to live without rigid rules or preconceived ideas. Empathy is the ability to recognize, feel, and respond to the needs and suffering of others. It facilitates the expression of caring, compassion, and kindness. It's situated at "true north" on the compass to symbolize the outward impact of educating young citizens committed to creating a just, sustainable world. We influence children's abilities to care for others beyond themselves by creating meaningful relationships with them, ensuring that they are seen, felt, and understood regardless of how they learn. When we expose them to different worldviews, engage them with community projects, and bring service learning into the classroom, we develop greater empathy and compassion. 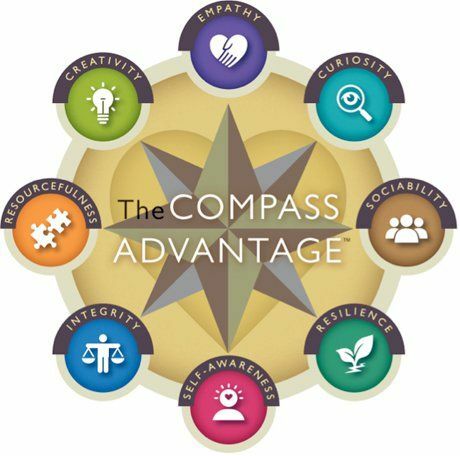 The Compass Advantage views education and child development as integrated processes nurtured through the collaborative efforts of parents, teachers, and out-of-school programs. When we attend to the development of these eight abilities, the results are transformative. Not only do children become lifelong learners, they become what Maria Montessori envisioned -- self-sufficient navigators of their own lives.